“The single most effective thing a homeowner can do to minimize the presence of mosquitoes is eliminate standing water wherever it occurs.” – Ryan Larsen, aka “Dr. Drainage,” civil engineer, NDS, Inc. 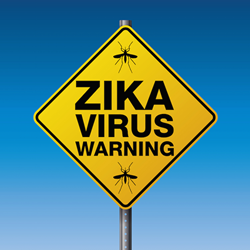 In light of ongoing news reports and public concerns about Zika Virus and its transmission by mosquitoes, NDS, Inc., a leading manufacturer of stormwater management and drainage products, encourages all homeowners to be proactive about existing or potential drainage problems so they don’t run the risk this summer of having their yards, gardens and driveways become a breeding ground. 1. Identify actual or potential trouble spots. Is there a low area in the yard where water collects after rain? Are downspouts or gutters clogged with debris? Does water linger along a retaining wall, edging, walkway or patio? Mosquitoes can lay their eggs in very shallow standing water, so anywhere water collects could be a breeding ground. 2. Address the easy fixes first. The gutters, downspouts and minor collection spots are easily addressed by simply clearing away the obstructions. When those issues are resolved, homeowners should concentrate on addressing low areas on their properties. Specifically, it’s important to look for muddy, wet areas because they can kill grass and attract mosquitoes that can eventually lead to more serious damage to a homeowner’s property. 3. Determine the scope of the problem. Standing water on a property can occur in multiple spots, from walkways to lawns. NDS has an online Home Drainage Center that helps homeowners identify problems and provides step-by-step instructions for installing solutions as well as a “shopping list” of parts needed to fix a particular problem. 4. Choose and install your solution. Catch basins, French and channel drains, and underground drainage systems are typical solutions for many home drainage problems. Catch basin: Designed to trap sediment, debris, contaminants and pollutants so that they cannot enter drainage pipes, catch basins are installed beneath downspouts. Large objects, such as leaves, will be filtered out and heavier bits, such as dirt, will sink to the bottom of the basin. French drain: A trench filled with gravel or rock or containing a perforated pipe, a French drain directs storm water away from a specific area, blocks the passage of excess debris, and collects water over the entire length of the drain instead of one particular spot. Dry well: An underground structure that collects and retains runoff, a dry well is typically a round plastic container with holes in it to allow water to slowly seep out and return to the groundwater. Placing drainage underground not only minimizes the risk of mosquitoes breeding in standing water, it can preserve the visual appeal of a landscape. For example, for drainage solutions that involve catch basins, there is a wide selection of decorative catch basin grates available on the market, so the portion of the system that can’t be hidden will be visually appealing. Most drainage systems can be installed in just one weekend. NDS’s Home Drainage Center provides step-by-step instructions for installing drainage solutions and includes a “shopping list” of parts needed to fix a particular problem. 5. Take common-sense steps to protect yourself. The American Mosquito Control Association recommends that when you are outdoors, wear insect repellent on exposed skin and clothing. Choose repellants with an active ingredient like DEET, Picaridin, IR3535 or oil of lemon eucalyptus. Dark colors attract mosquitoes, so wear lighter colored clothing, and burn citronella candles or run a fan near the ground when you’re enjoying your deck or patio. NDS, Inc. is a leader in stormwater management for both residential and commercial markets. Since 1972, NDS has served as a primary source for stormwater management, efficient landscape irrigation and water flow management products and solutions. Headquartered in Woodland Hills, California, NDS is a proud member of the NORMA Group, a global market leader in engineered joining technology. For more information about NDS, visit http://www.ndspro.com.